Villa Irini Cyprus is a pleasant 4 bedroom property located in the Cypriot countryside. The charming harbour of Latchi, which is famous for its seafood tavernas and beach is less than 10 minutes' drive away. What's more the traditional village of Polis is a little bit further. 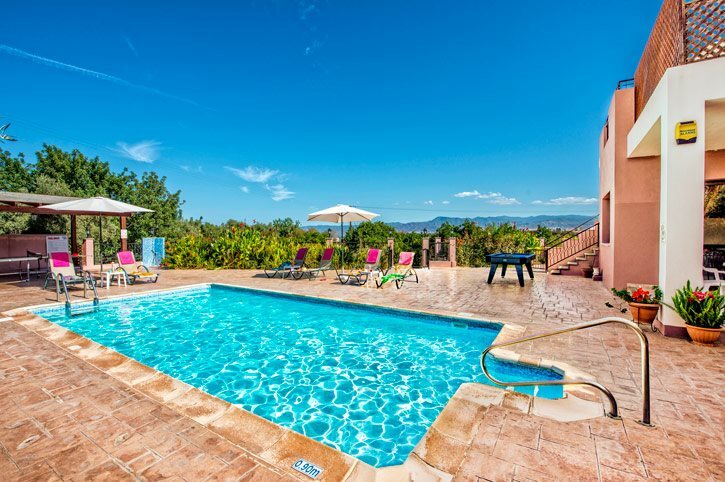 This villa has a spacious outside space and private pool for all the family to enjoy and soak up the sun. Air conditioning/heating in the bedrooms, pool heating and WiFi are included. Perfect villa for a relaxing holiday in the countryside. The views from roof terrace are amazing! Outside, the inviting private pool is surrounded by a spacious terrace. There is also a shaded terrace with dining table and chairs - perfect for alfresco meals. The BBQ is to the rear of the villa with convenient access to the kitchen for cooking the local cuisine. There is also a lawned area and games tables for all the family to enjoy. From the parking area, the 6 steps lead to the shaded terrace and front door. The lounge is open plan with the dining area and has a dining table and chairs, a comfortable seating area overlooking the private pool and views of the surrounding countryside. The well-equipped kitchen leads out to the rear of the property and BBQ area. The 2 twin bedrooms share the facilities of a separate bathroom. The remaining 2 double bedrooms are en suite - one with shower room and the other with a bathroom. All 4 bedrooms have access to the outside terrace. There is also a WC. Steps at the side of the villa lead up to the roof terrace, where there's a further set of dining table and chairs. This area can be used for dining, soaking up the sun, or cocktails at sunset with views of Chrysochous Bay and sea. Villa Irini Cyprus is ideally located in a beautiful countryside setting amongst citrus and olive groves. The centre of Latchi, the beach and harbour are all less than 10 minutes' drive away. The modern harbour is situated in the sweeping Chrysochous Bay and is fringed with shops, bars, restaurants and excellent fish tavernas. Asking for "the catch of the day" is a fish lover's delight. The authentic village of Polis with its shops, restaurants and beach is a little bit further away. Villa Irini Cyprus is located a short drive from several mini markets in Latchi and Polis. Paphos Old Town is just over an hours' drive away, and with its narrow streets and covered market, is worth a visit. Latchi is famous for its quality fresh fish and seafood restaurants. Polis Square and its surrounding area has several bars and restaurants but the ambience itself remains laid back. This villa is less than 10 minutes' drive to Latchi Beach. Alternatively, driving further east is the beach at Polis whilst heading south you will find the blue flag beach at Coral Bay. Paphos Zoo is great for a day out. One of the 4 most popular water parks on the island is the Aphrodite Waterpark in Paphos, which has an area and rides for smaller children such as slides, fountains, water guns, and even a slippery octopus to climb! The Akamas National Park is an area of breath-taking, rugged beauty. The best way to familiarise yourself with this region is to explore on foot, on official trails with bottles of water, sun screen and sturdy footwear. With over 530 species of flowers the park is often a blaze of sensational colours. The Mario's Golf has a driving range, crazy golf and even foot golf. Alternatively, if you're looking for a 'real' round of golf, Tsada golf club would be another choice. Neo Chorio is a very traditional Cypriot village, close to Latchi and has stunning views making it the ideal place to get away from it all. Villa Irini Cyprus is not available to book for season as it is sold out. Take a look here at the Cyprus villas that are currently on sale. Latchi beach is a short stroll from the harbour area along the main resort road. This is a pebbled beach that is ideal for snorkelling due to the crystal clear waters. There are many tavernas close by all with toilet facilities. Polis beach is located a short distance from the village square. There is a woodland shaded area which is used as a campsite particularly during Cypriot public holidays. This beach boasts a mixture of coarse sand and shingle with stones and pebbles in the water. There is a small on site taverna with toilet facilities. This is generally a quieter beach. Paphos used to be the old capital of Cyprus under Ptolemies and its harbour was one of the most thriving in the Mediterranean. The upper part of Paphos, its myriad of shops and old traditional market, is characterised by its old classical type buildings. The remarkable history of Paphos makes the town a museum in itself. UNESCO included the whole town on its list of cultural and natural treasures of the world heritage. The area is steeped in legends from ancient mythology and with a succession of conquering invaders over the centuries the museums are full of treasures depicting many eras. There are monuments and sites that date from the stone age, Greek temples, Roman theatres, Venetian ruins, relics from the Crusaders and a mass of treasures from the Byzantine era. The lower part of Paphos, Kato Paphos is home to the old fort, built in 1592 by the Ottomans, and is now a thriving tourist area. Every September an opera is held by the harbour at the site of the old fort and is attended by people travelling from all over the world. Full of tourist shops, bars, clubs and restaurants, Kato Paphos mixes the old with the new. The harbour has a variety of boat trips and is a scenic spot to enjoy a coffee or evening meal and watch the world pass by. The amazing mosaic floors of the House of Dionyssos are to be found just a two minute walk away. Nightlife in Paphos can be anything you want it to be. The main area of late night clubs, and the more noisy, tend to be clustered together so that they can be easily accessible (or avoided!). There are many stretches of beach in Paphos and almost all have a large variety of water sports. Several places of interest to visit on your villa holiday, include the Tombs Of the Kings Museums, Ayios Neofytos monastery, Paphos Aquarium, Paphos Water Park, Paphos Bird and Animal Park. Scuba Diving is available from a number of PADI affiliated dive centres – Cydive is one of the larger diving schools located by the main harbour. Horse riding is available on the main road from Coral Bay to St Georges at Georges Ranch. If you like to relax with a game of golf on your villa holiday there are 3 golf courses within a relatively short driving distance to Paphos: Tsada, Secret Valley and Aphrodite Hills. On arrival the pool was a little cold and when we told our Rep, she had the owner of the villa there within two hours to turn up the heating and revisited the following day to ensure that we were happy. We have been holidaying in villas for twenty years and found Villa Plus a wonderful experience all around and will definitely be booking again. Clean, bright villa - a good size in the country & on a large plot of land, so no one too close. This villa is ideal for everyone, but you will need a car. Fabulous villa, very clean, spacious and with fantastic views from roof terrace. Very peaceful surroundings yet a short drive to the harbour and beach with amazing tavernas! Absolutely lovely holiday!! Villa Irini was of a very high standard, beautiful location and very peaceful we could not fault it at all. We really enjoyed our stay there. A beautiful villa in a lovely location. We had a very relaxing holiday. We had a superb time and the location was brilliant. The villa owner was around on the odd day and was great too - really nice family and most helpful. I will be using Villa Plus next year. We are looking to book the same villa. Thanks again - its great to find a company that delivers.